Black River Falls, WI 54615 — April, 2019 — New release, Wisconsin Moments In Time, by Lori Chown will be available at BRF PTO Spring Craft and Vendor Fair, Saturday, April 13th from 9am - 2pm featuring Jackson County, Wisconsin in one of Lori's photo journeys. 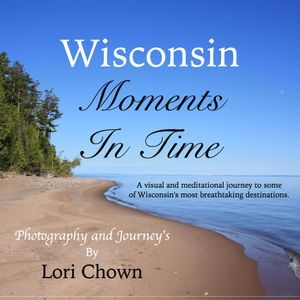 "Wisconsin Moments in Time" by Lori Chown is a coffee table style book featuring over 100 photos and 12 journeys to some of Wisconsin's most memorable destinations, including Jackson County. There are memorable places in every state, but Wisconsin offers some of the most scenic and peaceful places of beauty in the nation. Wisconsin Moments in Time captures some of your favorite places as enjoyed by the author. From the beauty of Bayfield, to the quaintness of Door County, to the quiet escape of Jackson County, author and photographer Lori Chown takes you to some of her favorite moments in time. With Moments In Time, Lori Chown combines her breathtaking photography with a meditational journey, to help you appreciate each majestic scene and perhaps find a measure of peace along the way. These journeys remind us to live in each moment and experience the wonder that has been created. Our lives are made up of the simplest of moments, but each one is magical. How we learn to appreciate these moments creates the tone for the rest of our days. To purchase a copy of “Wisconsin Moments in Time” contact Lori at [email protected] or visit her at the BRF PTO Spring Vendor Fair. Lori will be doing a reading of her children's book and an expert from her newest book, Wisconsin Moments in Time at 11am and 1pm.